If you haven't been keeping up with the Lawrence/Julie & Julia Project recently, I forgive you. Hell, I'm pretty sick of this blogging thing too, so I can't blame ya. Just be sure to check out yesterday's extra special "Guess Who's Coming to Dinner" post. I promise that it'll be worth your while. 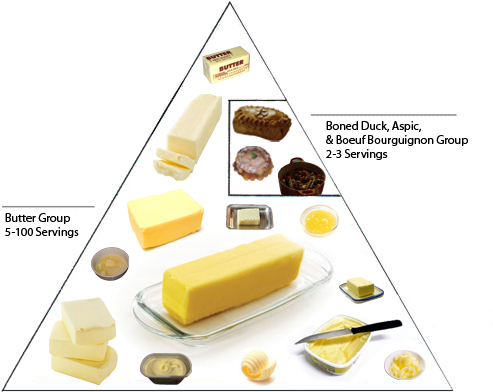 In the meantime, I decided to take a stab at illustrating what the food pyramid would look like if Julie & Julia were in charge of putting it together (Thanks to my good buddy Annie C. for the idea!). Julie & Julia Quote of the Day: "I'm going to spend it eating butter." You are my hero. Nice photoshop. i get credit?! happiest day of my life. Butter is the only food group worth knowing about!